I went back home this week. To tell the truth, I found it really hard to work at home. There were too many things to do with my family when we get a reunion. Also, due to the jet lag, I was too tired to do any work. However, I still read some picture books which I had read when I was a little girl. I think the concepts of these books had planted deep in my heart and had inspired me to come up with the idea of my FMP. These books were Drop Dead（精彩過一生）, Hat Opa einen Anzug an? （爺爺有沒有西裝？）and Badger’s Parting Gifts（獾的禮物）. They were all translated into Mandarine. Apart from these three books, I read some more picture books which were recommended from online bookshops and articles. 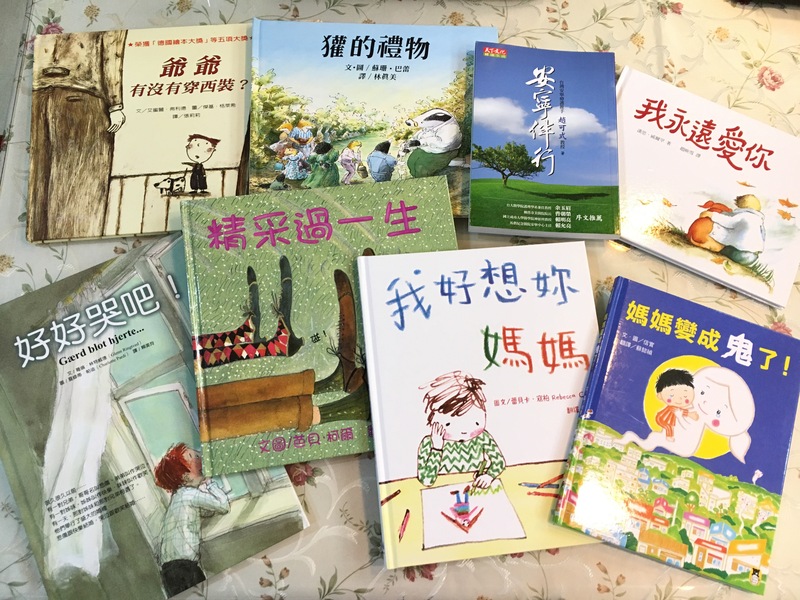 Surprisingly, I found out that most of the picture books which Taiwanese people recommended were translated from Japan, the USA, the UK, Germany or other countries. There were only a few of them were originally written, illustrated and published in Taiwan. I knew that it was not easy to support a picture book author and illustrator in Taiwan so this might be the reason why there were not so many Taiwanese original picture books. Thus, the topic of death might still be hard to talk about in Taiwanese/ Chinese culture. As a result, it’s more likely to see only a few original Taiwanese picture books which topics are about death. While reading through these translated picture books, I found that most of the stories had a certain cultural perspective. Nevertheless, these cultural perspectives didn’t lead to a misunderstanding to the story as I expected. Surprisingly, no matter which country the author came from, the story could still touch readers’ hearts. This finding was really interesting and meaningful to me. I think I could be more creative and unlimited to my story and feel free to include some cultural perspective. In the situation of tiring and hard to do any work, I finally went to Laima Picture Book Art Gallery today as I planned. I’ll write another blog entry about the experience of this visit.